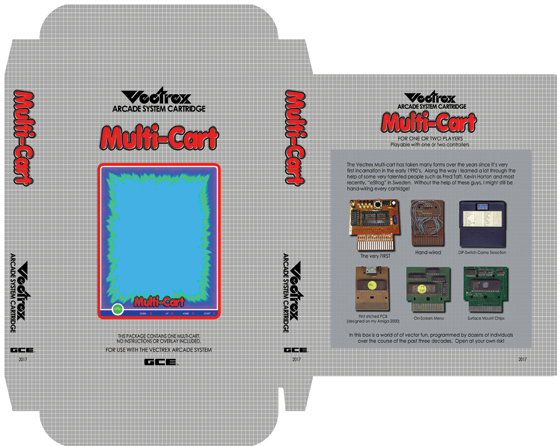 For the first time ever, I have a box available for the multi-cart! I assume that I am like most people in that half of the fun of collecting this stuff is when you can sit back and just enjoy how everything looks nice and neat on a shelf. The multi-cart has always kind of been left out of that realm of collecting because it didn't have a box and even though I stood the cart up on a shelf in front of my boxed carts, it just wasn't quite the same. With a brand new version of the multi-cart, I figured now is the perfect time to finally pair the multi-cart with a professionally printed BOX! I intentionally did not mention a version number of the multi-cart on the box itself because I figured there will probably be some people who are cool with the version of the multi-cart that they already have but would still like to add a box to their collection. You are perfectly welcome to buy just the box if you don't want to upgrade your multi-cart. The box comes complete with an insert to hold your cartridge securely and prevert it from flopping around inside the box. The insert is included with the box at no additional charge. Even though there is an ovelay depicted on the front of the box, NO OVERLAY IS INCLUDED with the multi-cart. I just wanted the box style to be the same as the original boxes since they all show an overlay on the front of the box. On the back of the box is a pictorial history/timeline of the multi-cart over the past twenty-five years. The price of the box (including insert) is $12 if bought with a multi-cart or $15 if bought separately.